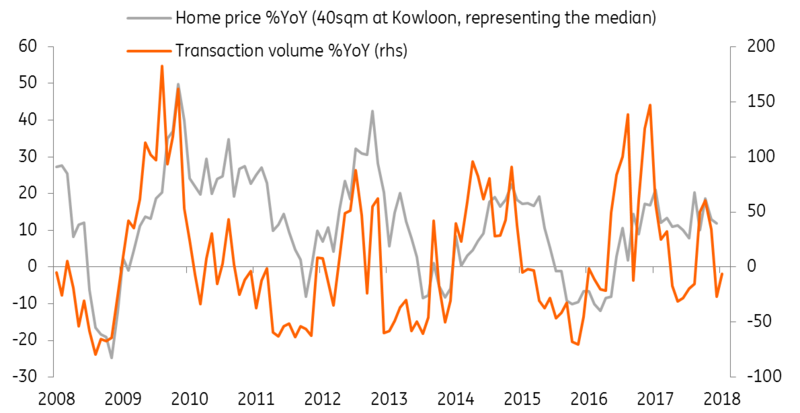 Hong Kong GDP grew 4.7% year-on-year in 1Q18, which is strong but consumption is even stronger at 8.6%YoY. We underestimated growth at 3.4%YoY in 1Q, the same as consensus. Consumption growth could be due to the wealth effect of rising home prices, which have increased more than 20% for most housing units in 12 months. Though other components also grew at a decent rate, we argue that those were mainly due to the base effect from 1Q17. Home prices are not likely to stop rising unless there is a big negative unexpected event in the market. Rising interest rates from more Federal Reserve rate hikes would certainly increase the burden of mortgage borrowers, so home prices would rise at a slower pace. But we do not expect a fall in property prices. With new flats becoming smaller, property developers are able to keep new homes affordable to young people with wealthy parents. In addition, rising home price expectations would also induce existing home owners to refinance their mortgages, even at high interest rates, to invest in an additional property, hoping for some capital gains in the longer term. In other words, the wealth effect would continue to exist for a few more quarters. On the other hand, we believe that the escalating trade tensions could disrupt Hong Kong's re-export businesses. Those activities would be mainly shipping, port, logistics and trading businesses. 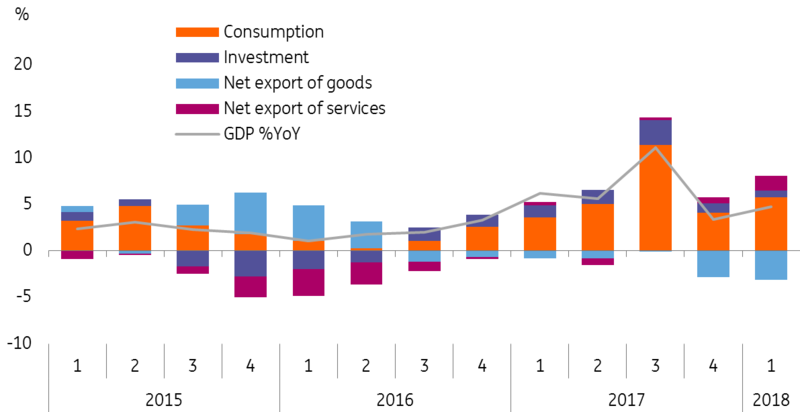 We maintain our GDP forecasts for the remaining months of 2018, as good growth from consumption will be offset by trade-related service activities. But the strong growth in the first quarter is sufficient for us to revise our GDP forecast for 2018 to 3.8% from 3.4%.